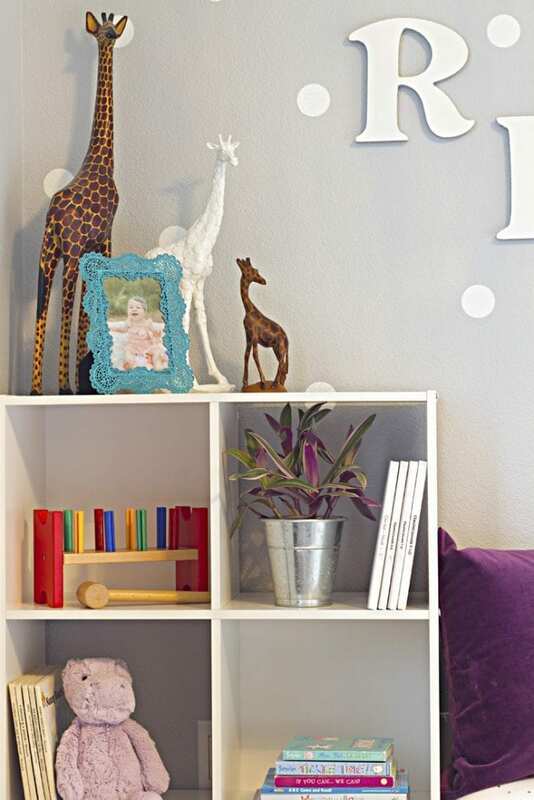 This Montessori room makeover filled with many DIY decor and is a perfect inspiration for toddler girl room ideas. About two months ago I started seeing people talk about the One Room Challenge and I’d always admired people who participated in seasons past. After a little begging and pleading with my DH, he hopped on the bandwagon and I started dreaming up some ideas to tackle our guest room and turn it into a toddler chic bedroom for our little two-year-old before baby #2 comes and takes over the nursery. Today I’m so excited to finally show you how the room turned out! Just as a reminder, though, for the past three years this room was our guest room and storage space. As we cleaned out the room in week one we found boxes in the closet that had never been unpacked four years ago and letters and pictures from when we first started dating back in high school. It was fun to go through but definitely time to purge and make room for our growing family. The “this is love” collage print was so darling and simple to create online. I was able to pull pictures straight from albums I had already created on Facebook so I didn’t even have to go searching for the photos I wanted to include. The teal arrow was a fun project I brought home when I attended SNAP Conference this past Spring during a workshop with Heidi Swapp. I love that I finally found the perfect space to include it! The quote art I created in Adobe Illustrator and uploaded the images directly to Mpix’s website. 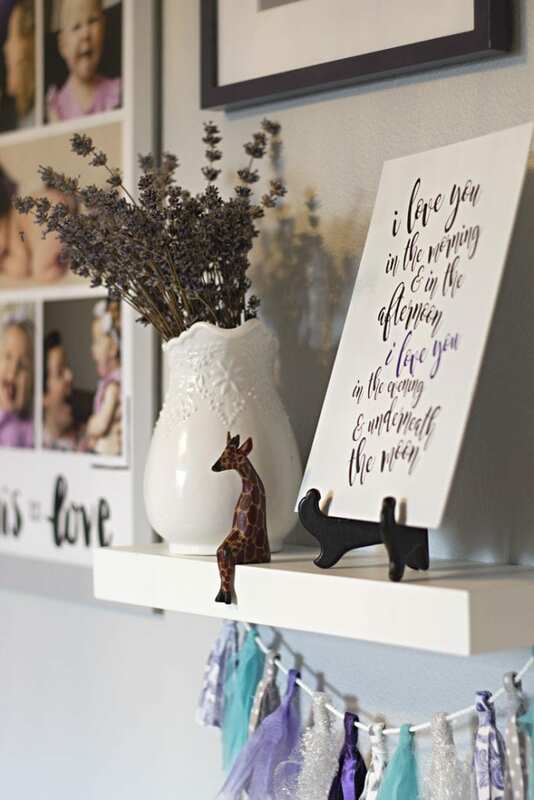 The song lyrics on the floating shelf might be one of my favorite things in the room because I sing that song to Clara often and I love that I found a way to include it in the room. I had it mounted on foam board through Mpix to include in the gallery wall and I love how it looks on this floating shelf. Ever since I made the tissue paper tassels for our gender reveal party this past summer I’ve been looking for an excuse to make some more. I scoured the remnant fabric shelf at our local Joann’s Fabric and bought some fun fabric that matched the room to throw together this cute fabric tassel garland. Check out this tutorial on how to make your own tassels. They really are so simple and can be used for any occasion once you find the right color and material. I love how the whole wall turned out!! Moving on, the dresser was an absolute steal! I perused Craigslist for a few week’s before I came across THE PERFECT ugly dresser to makeover. Literally, it could not have fit the wall better! After some primer, a few coats of Benjamin Moore Advance in Simply White and some new gorgeous chrome hardware I knew we had a winner! P.S. If you come to my house you’ll hear me rave about the Advance paint. Literally, I want to redo all our furniture now with that paint. After just one coat it got super tough and I knew it would be perfect to handle life in our kid’s room. A few days ago, once all the DIY projects were done and all the furniture was in the room, we realized the room arrangement I had planned out weeks ago didn’t jive. The play kitchen corner looked super awkward next to the dresser wall so we started testing out different layouts. Eventually, we decided on the bed beneath the window but then the plum curtains that we planned to use from Clara’s nursery clashed with the darling ruched comforter I bought. So back to the drawing board! And although I still LOVE the comforter, it ended up just not working in the room and match the chic bedroom look I was going for. Luckily, we realized the puff quilt I made for Clara before she was born fits perfectly in the new room. Add a blanket and throw the puff quilt on top and you have yourself a darling little bed set up for a little girl. See how to make your own puff quilt here. It’s a perfect baby shower or Christmas gift! As I mentioned in my original post during week one, I wanted to create a Montessori-inspired room for Clara to encourage play, learning, and independence. 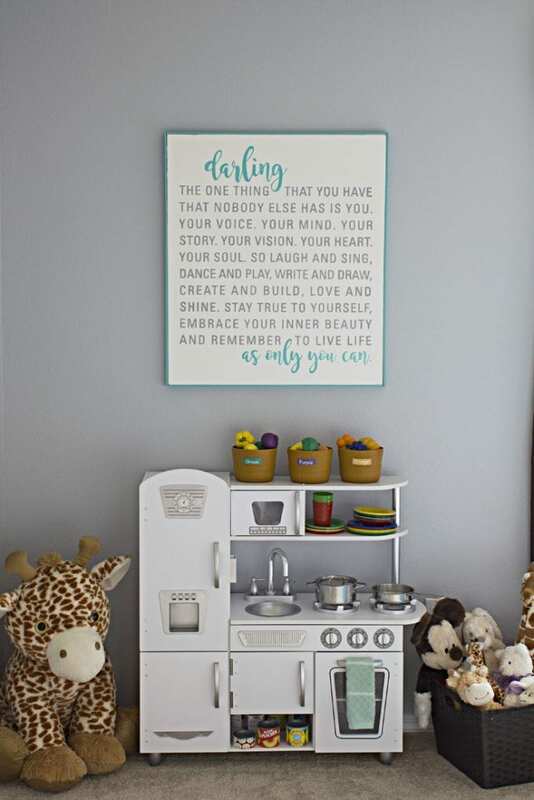 When you first walk in the room you see this wall that has a vintage kitchen filled with kitchen cookware, dishes, and play food. Above the kitchen is this graphic darling quote on a custom canvas we made — well my husband made…I knew I married an art student for a good reason. I seriously LOVE how it turned out and will be a great reminder to Clara to BE YOU. Full tutorial coming your way soon on the canvas art. So, where do I even begin with this view of the room? Let’s start at the top and work our way down, m’kay? First, can we just talk about that chandelier?! This chrome pendant chandelier I got from Orchard Supply Hardware has 96 crystal strands and just shimmers in the room. It’s hard to photograph, but looks stunning!! Next, I’m totally loving how the vinyl decal feature wall turned out! Tutorial coming your way in the next few weeks but thanks so much to Expressions Vinyl for the shimmering white glitter vinyl that helps make the reading nook pop. If you follow along on Facebook, you know I went back and forth on if a cornice board was too old lady or not. Well, as you can see I went with it and I totally love how it turned out!! You can see how to make your own cornice board here. It adds a nice, feminine touch to the room and is a perfect feature to highlight the one window in the room. I took two of those ugly canvases that were up in our old guest room, spray painted them white to hide the old design, and then wrapped them in some of the leftover fabric from the fabric tassel garland. Next to the canvases is an old frame painted white and then I used eyelets to attach a string so we can showcase some of Clara’s many colorings she’s done. And then we’ve got the cube storage that is perfect for holding toys and books from her growing collection. The 1×2 cube storage was the perfect thing to turn into a reading bench. I found some rhinestone fabric, got some foam, made a cushion, and we have ourselves a darling little reading bench for my little bookworm. Clara-girl could read books for hours!! You can see I also made a matching cushion for Clara’s rocking chair she got as a birthday present last year. And before we leave the room, of course, I have to show you her little coat hook holding her peacoat that I’ve been anxiously waiting for the day she can fit in for over a year and her little backpack and boots. 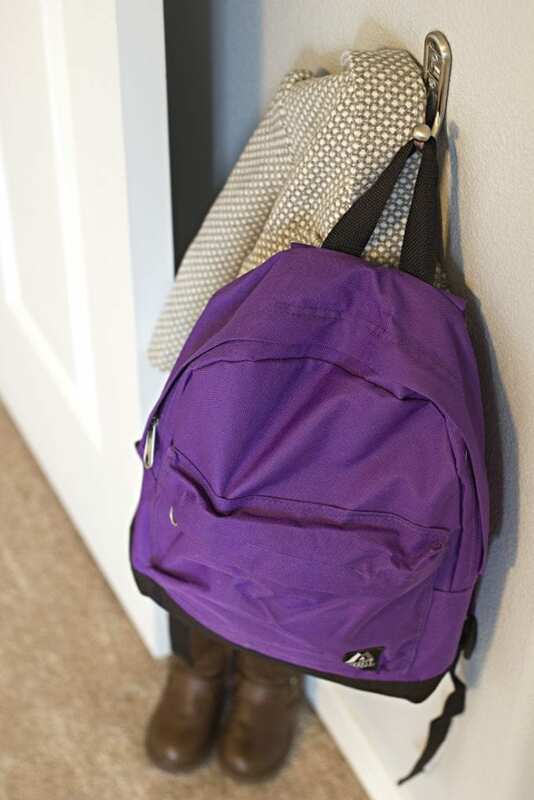 We’ve slowly been working on her independence and one of those things is putting her coat and shoes away when we get home and carrying her own backpack when we’re out and about with what she needs. Soon mommy’s hands will be full with a new little baby, so having organization and independence is going to be key to our success in actually leaving the house each day. I could not be more excited with how this whole room turned out!! I seriously could NOT have done it without my husband who agreed to tackle all my crazy DIY project ideas and or the fact we decided to take on this room so close to my due date with baby #2. It was a little risky looking back, but I’m so glad we decided to just go for it! 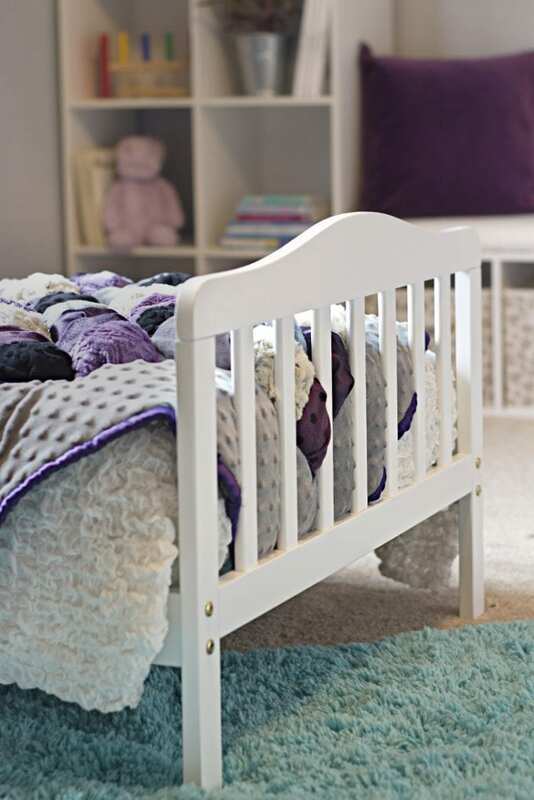 What are your thoughts about our toddler girl bedroom? Check out all the related posts and links to shop this room below. Thank you SO MUCH to Orchard Supply Hardware for providing all the paint for this room makeover! I had so much fun putting this room together and making new things for this room. Click the links below to see related tutorials for all the projects you see in this room and check back often for many more tutorials coming your way in the next few months. Darling Canvas – coming soon! DIY Picture Frames – coming soon! Bench Cushion – coming soon! Vinyl Feature Wall – coming soon! Click the links below to shop this room and make your own Montessori-inspired toddler chic bedroom. If I couldn’t link to the exact product I included a link to something very similar. Affiliate links may be provided for your convenience. For more information, see my disclosure here. Thanks for supporting A Crafted Passion! And because what One Room Challenge post would be complete without a project list update? I actually had a running task list on my computer that included almost 50 things that got checked off by this past weekend, but here’s the condensed version. And a HUGE thanks to Linda at Calling It Home for hosting the One Room Challenge! I had so much fun with this room makeover and am already dreaming up what room we should do for the Spring season. P.S. This post was sponsored by the companies listed below, though all opinions are 100% my own. For more information, please read my disclosure here. SUCH a fun little space Amanda! I bet she absolutely loves it!!! THanks Krisit! Yes, she does!! Such a beautiful and chic transformation! 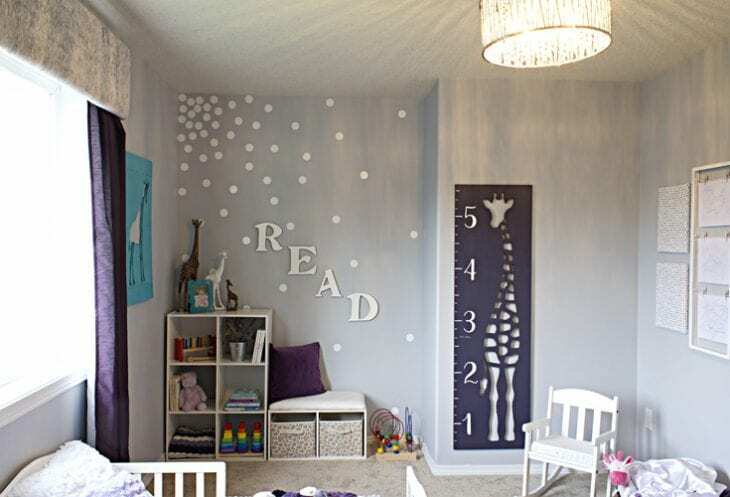 I love all the details you incorporated into this room, especially that growth chart area! Congrats on a job well done. So fun to have followed along these 6 weeks. Thanks, Tee! That growth chart was so fun to make! I love all the montessorie details. This room is spectacular. What a lucky little one. Love this room! The giraffes and the darling quote – love love love. I love how it turned out. You did an amazing job. Way to go! 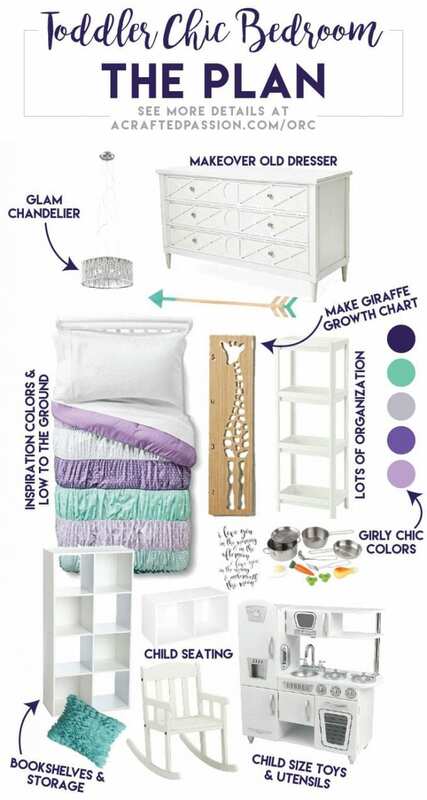 That giraffe growth chart has to be my favorite part! Beautiful! 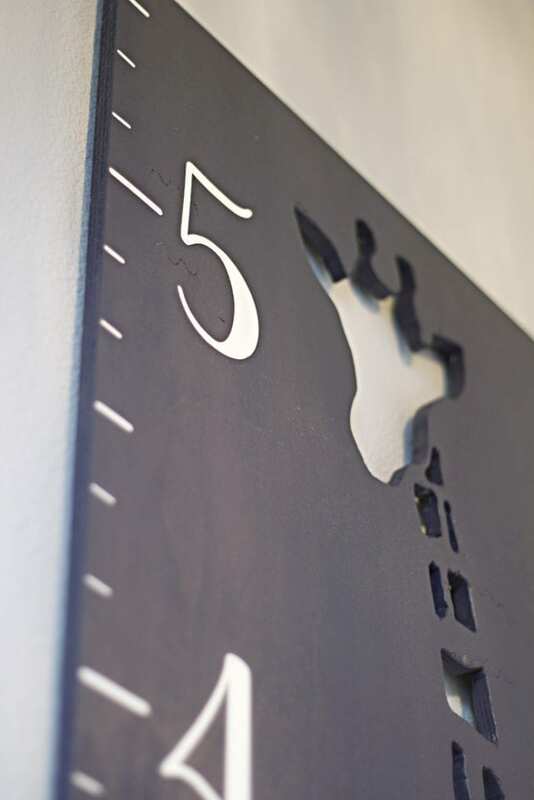 My favorite is the giant giraffe growth chart – how fun! I love the colors and wish I would have had a room this stylish as a little girl. It’s been fun to follow along on your progress! amanda, this is such a fun room! i love the reading area, and the unique color combo! but that growth chart! you nailed it! Oh my goodness, it looks so good! You’re a rock star! Amanda, I love it! 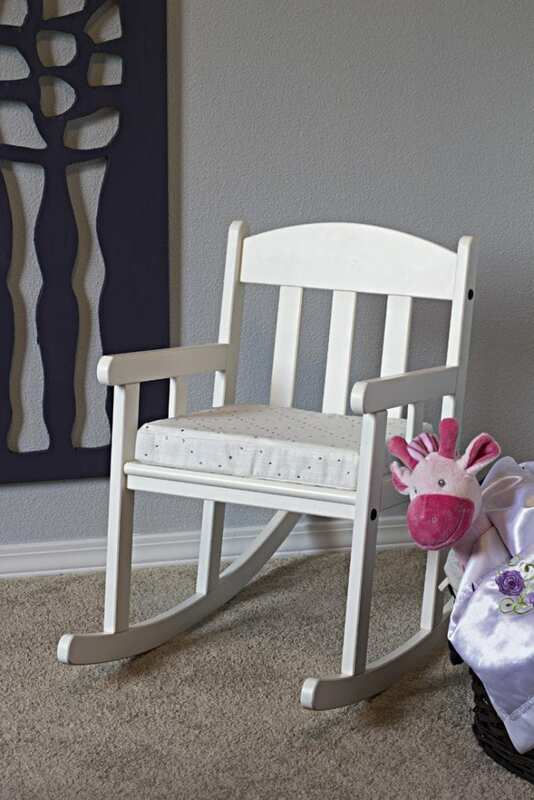 It is SO cute, the colors are fabulous, and I LOVE that growth chart!!! What an absolutely adorable space!! I bet your daughter just loves it!! I love all of your artwork and attention to detail! Can’t wait for some of your tutorials!! It’s so cute!! Lots of play areas and storage. I bet you have one happy kiddo! This is such a fun room! I love all the giraffe accents and the color palette you chose. Your daughter is one lucky lady! The room turned out great! I love all the little detail you put into it. My daughter would never want to leave if she saw this space! 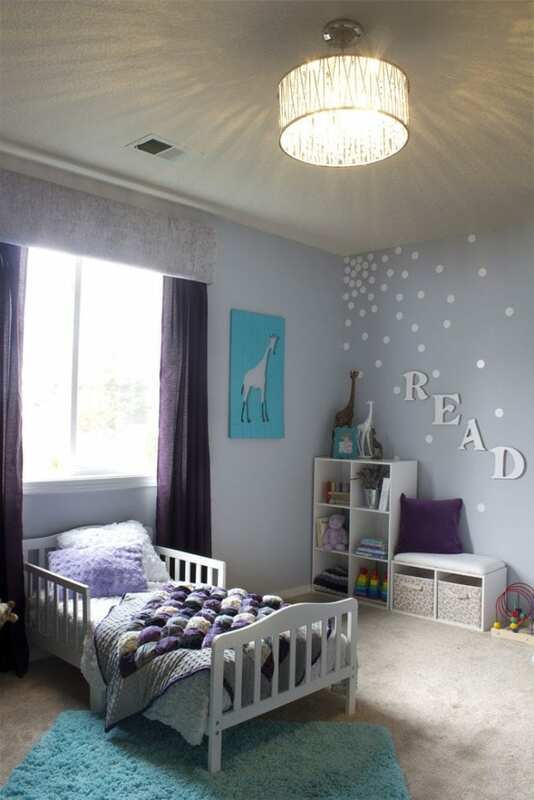 Cute space for a little girl, love the lavender! Can we talk about that little giraffe sitting on the edge of a ledge? How cute! That giraffe growth chart is ahhmazing!! It’s such a fun, colorful room. I bet your daughter loves it! Your little girl is SO lucky! This space is beautiful. That giraffe piece on the wall is so amazing. I can’t believe how much you did while expecting. You’re a rock star. Such a cute room! Your daughter is going to love every inch of it. Her room is so cute! I bet she loves it! I love the color scheme! Awww, she must be so happy in her space. Their smiles make all the effort worth it, right?! Amanda! This is such an adorable room! I bet she loves it!! Awesome job, my friend! What a perfect space for your little one to learn and grow! That puffed quilt caught my eye. Darling! Such a happy space! It’s adorable! BEAUTIFUL JOB!!!! I love every detail! I can’t wait for the growth chart tutorial!!! it turned out so sweet! 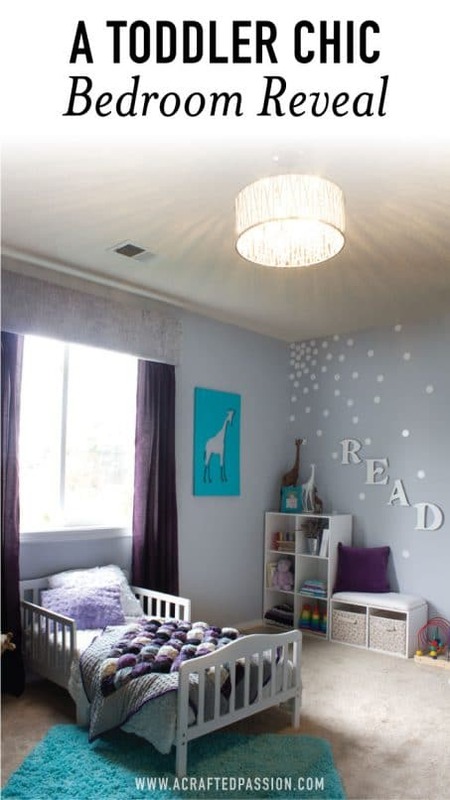 What a creative space for your little lady! My favorite is the gallery wall above the dresser. So cute. Such an adorable space! Love the puff quilt – so cute! Kids spaces are my favorite to decorate :) great job! So cute!! Love the color scheme you chose and giraffe theme too. I’m motivated more than ever now after seeing your darling room reveal to finish decorating my daughters’ rooms (5 and 18 months)!! I can’t believe you made that growth chart – it is so cool!!! I personally love the color pallet, as my girls now have some similar colors in their quilts too. You did a fabulous job on her new room, perfect for a growing little girl! It looks amazing, Amanda! 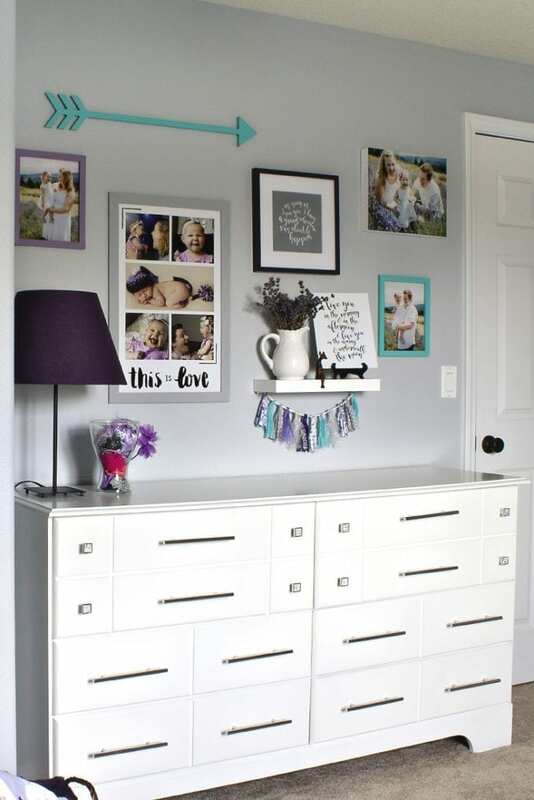 Such a perfectly sweet little girls room! Such an adorable girl’s room! I love your colors and that chandelier is amazing! So adorable, Amanda! I love everything about it. OMG this is adorable!! 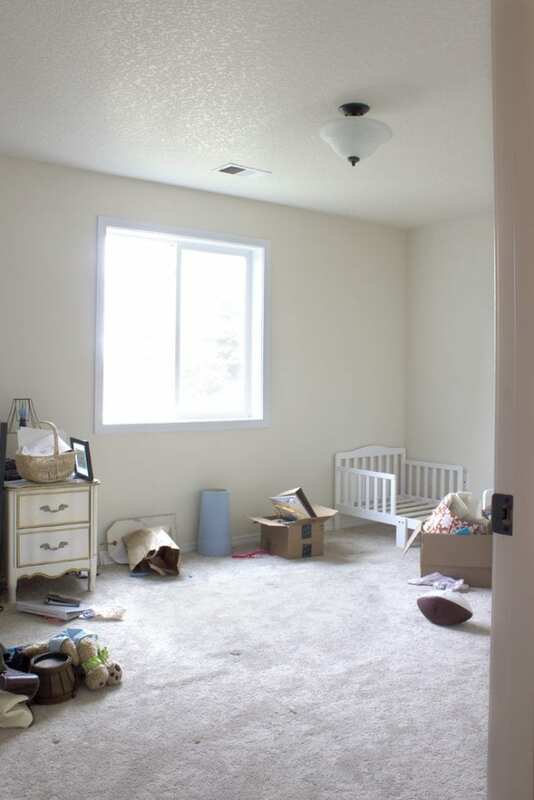 Such a sweet ‘big girl room’. You have a very lucky little lady! Love love LOVE!